This article is about the transport aircraft. For the B-29 that bombed Nagasaki, see Bockscar. C-119C, AF Ser. No. 51-2640, 781st Troop Carrier Squadron / 465th Troop Carrier Wing. The Fairchild C-119 Flying Boxcar (Navy and Marine Corps designation R4Q) is an American military transport aircraft developed from the World War II-era Fairchild C-82 Packet, designed to carry cargo, personnel, litter patients, and mechanized equipment, and to drop cargo and troops by parachute. The first C-119 made its initial flight in November 1947, and by the time production ceased in 1955, more than 1,100 C-119s had been built. Its cargo-hauling ability and unusual twin-boom design earned it the nickname "Flying Boxcar". The Air Force C-119 and Navy R4Q was initially a redesign of the earlier C-82 Packet, built between 1945 and 1948. The Packet provided service to the Air Force's Tactical Air Command and Military Air Transport Service for nearly nine years during which time its design was found to have several serious problems. All of these were addressed in the C-119. In contrast to the C-82, the cockpit was moved forward to fit flush with the nose rather than its previous location over the cargo compartment. This resulted in more usable cargo space and larger loads than the C-82 could accommodate. The C-119 also featured more powerful engines, and a wider and stronger airframe. 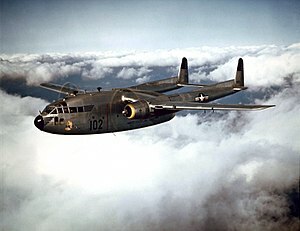 The first C-119 prototype (called the XC-82B) first flew in November 1947, with deliveries of C-119Bs from Fairchild's Hagerstown, Maryland factory beginning in December 1949. In 1951, Henry J. Kaiser was awarded a contract to assemble additional C-119s at the Kaiser-Frazer automotive factory located in the former B-24 plant at Willow Run Airport in Belleville, Michigan. Initially, the Kaiser-built C-119F differed from the Fairchild aircraft by the use of Wright R-3350-85 Duplex Cyclone engines in place of Fairchild's use of the Pratt & Whitney R-4360 Wasp Major radial engine. Kaiser built 71 C-119s at Willow Run in 1952 and 1953 (AF Ser. No. 51-8098 to 51-8168) before converting the factory for a planned production of the Chase C-123 that never eventuated. The Kaiser sub-contract was frowned upon by Fairchild, and efforts were made through political channels to stop Kaiser's production, which may have proven successful. Following Kaiser's termination of C-119 production the contract for the C-123 was instead awarded to Fairchild. Most Kaiser-built aircraft were issued to the U.S. Marine Corps as R4Qs, with several later turned over to the South Vietnamese air force in the 1970s. The AC-119G "Shadow" gunship variant was fitted with four six-barrel 7.62×51mm NATO miniguns, armor plating, flare launchers, and night-capable infrared equipment. Like the AC-130 that succeeded it, the AC-119 proved to be a potent weapon. The AC-119 was made more deadly by the introduction of the AC-119K "Stinger" version, which featured the addition of two General Electric M61 Vulcan 20 mm cannon, improved avionics, and two underwing-mounted General Electric J85-GE-17 turbojet engines, adding nearly 6,000 lbf (27 kN) of thrust. Other major variants included the EC-119J, used for satellite tracking, and the YC-119H Skyvan prototype, with larger wings and tail. In civilian use, many C-119s feature the "Jet-Pack" modification, which incorporates a 3,400 lbf (15,000 N) Westinghouse J34 turbojet engine in a nacelle above the fuselage. 403rd TCW C-119s drop the 187th RCT over Korea, 1952. The aircraft saw extensive action during the Korean War as a troop and equipment transport. In July 1950, four C-119s were sent to FEAF for service tests. Two months later, the C-119 deployed with the 314th Troop Carrier Group and served in Korea throughout the war. In December 1950, after Chinese PLA troops blew up a bridge [N 1]at a narrow point on the evacuation route between Koto-ri and Hungnam, blocking the withdrawal of U.N. forces, eight U.S. Air Force C-119 Flying Boxcars flown by the 314th Troop Carrier Group. [N 2] were used to drop portable bridge sections by parachute. The bridge, consisting of eight separate sixteen-foot long, 2,900-pound sections, was dropped one section at a time, using two parachutes on each section. Four of these sections, together with additional wooden extensions were successfully reassembled into a replacement bridge by Marine Corps combat engineers and the US Army 58th Engineer Treadway Bridge Company, enabling U.N. forces to reach Hungnam. From 1951 to 1962, C-119C, F and G models served with U.S. Air Forces in Europe (USAFE) and Far East Air Forces (FEAF) as the first-line Combat Cargo units, and did yeoman work as freight haulers with the 60th Troop Carrier Wing, the 317th Troop Carrier Wing and the 465th Troop Carrier Wing in Europe, based first in Germany and then in France with roughly 150 aircraft operating anywhere from Greenland to India. A similar number of aircraft served in the Pacific and the Far East. In 1958, the 317th absorbed the 465th, and transitioned to the C-130s, but the units of the former 60th Troop Carrier Wing, the 10th, 11th and 12th Troop Carrier Squadrons, continued to fly C-119s until 1962, the last non-Air Force Reserve and non-Air National Guard operational units to fly the "Boxcars." The USAF Strategic Air Command had C-119 Flying Boxcars in service from 1955 to 1973. Perhaps the most remarkable use of the C-119 was the aerial recovery of balloons, UAVs, and even satellites. The first use of this technique was in 1955, when C-119s were used to recover Ryan AQM-34 Firebee unmanned targets. The 456th Troop Carrier Wing, which was attached to the Strategic Air Command (SAC) from 25 April 1955 – 26 May 1956, used C-119s to retrieve instrument packages from high-altitude reconnaissance balloons. C-119s from the 6593rd Test Squadron based at Hickam Air Force Base, Hawaii performed several aerial recoveries of film-return capsules during the early years of the Corona spy satellite program. On 19 August 1960, the recovery by a C-119 of film from the Corona mission code-named Discoverer 14 was the first successful recovery of film from an orbiting satellite and the first aerial recovery of an object returning from Earth orbit. The C-119 went on to see extensive service in French Indochina, beginning in 1953 with aircraft secretly loaned by the CIA to French forces for troop support. These aircraft were generally flown in French markings by American CIA pilots often accompanied by French officers and support staff. The C-119 was to play a major role during the siege at Dien Bien Phu, where they flew into increasingly heavy fire while dropping supplies to the besieged French forces. The only two American pilot casualties of the siege at Dien Bien Phu were James B. McGovern, Jr. ("Earthquake McGoon") and Wallace ("Wally") A. Buford. Both pilots, together with a French crew member, were killed in early June, 1954, when their C-119, while making an artillery drop, was hit and crippled by Viet Minh anti-aircraft fire; the aircraft then flew an additional 75 miles east into Laos before it crashed. 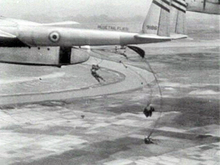 During the Sino-Indian War of 1962, the C-119 was extensively used to supply Indian forces. President Kennedy allowed sales of spare C-119 on a priority basis upon request by the Indian government. During the Vietnam War, the incredible success of the Douglas AC-47 Spooky but limitations of the size and carrying capacity of the plane led the US Air Force to develop a larger plane to carry more surveillance gear, weaponry, and ammunition, the AC-130 Spectre. However, due to the strong demands of C-130s for cargo use there were not enough Hercules frames to provide Spectres for operations against the enemy. The Air Force filled the gap by converting C-119s into AC-119s each equipped with four 7.62 minigun pods, a Xenon searchlight, night observation sight, flare launcher, fire control computer and TRW fire control safety display to prevent incidents of friendly fire. The new AC-119 squadron was given the call-sign "Creep" that launched a wave of indignation that led the Air Force to change the name to "Shadow" on 1 December 1968. C-119Gs were modified as AC-119G Shadows and AC-119K Stingers. They were used successfully in both close air support missions in South Vietnam and interdiction missions against trucks and supplies along the Ho Chi Minh Trail. All the AC-119G Gunships were transferred to the South Vietnamese in 1973 when the American forces were withdrawn. During the late 1960's and early 1970's, National guard pilots flew C-199's as trainers for the US Army jump school at Ft. Benning, Georgia. The jumpers often were heard to say, I would rather jump out then have to try a landing in one of these. After retirement from active duty, substantial numbers of C-119s and R4Qs soldiered on in the U.S. Navy, U.S. Marine Corps, the Air Force Reserve and the Air National Guard until the mid-1970s, the R4Qs also being redesignated as C-119s in 1962. The last military use of the C-119 by the United States ended in 1974 when a single squadron of Navy Reserve C-119s based at Naval Air Facility Detroit/Selfridge Air National Guard Base near Detroit, Michigan, and two squadrons based at Naval Air Station Los Alamitos, California replaced their C-119s with newer aircraft. Many C-119s were provided to other nations as part of the Military Assistance Program, including Belgium, Brazil, Ethiopia, India, Italy, Jordan, Taiwan, and (as previously mentioned) South Vietnam. The type was also used by the Royal Canadian Air Force, and by the United States Navy and United States Marine Corps under the designation R4Q until 1962 when they were also redesignated as C-119. C-119C shown in Hemet Valley Flying Service livery as Tanker 82 before being retired; now at the Milestones of Flight Museum in Lancaster California. (note the jet pod above the fuselage). A number of aircraft were acquired by companies who were contracted by the United States Forest Service (USFS) and the Bureau of Land Management to provide airtankers for fighting wildfires. Others were pressed into civilian cargo service. After a series of crashes, the age and safety of the aircraft being used as airtankers became a serious concern, and the U.S. C-119 airtanker fleet was permanently grounded in 1987. Eventually, many of these aircraft were provided to museums across the U.S. in a complicated – and ultimately illegal – scheme where stored USAF Lockheed C-130 Hercules transports and Navy Lockheed P-3 Orion anti-submarine patrol aircraft were provided to the contractors in exchange for the C-119s. (See U.S. Forest Service airtanker scandal.) After the end of the airtanker days, many C-119s flew in Alaska for Northern Pacific Transport, Gifford Aviation, Stebbins & Ambler Air transport, and Delta Associates, being used for public service contracts, such as hauling building materials to the villages in the bush of Alaska that have no road access. Several aircraft were observed, as late as 1990, by paratroopers with the 6th Infantry Division, to be in Forest Service use as jump planes for "smokejumper" firefighters in Alaska. These aircraft were boarded and toured, by the Army paratroopers, at Ft Wainwright, Alaska. The XC-82B modified to production standards, later became C-119A, then EC-119A as an electronics test bed. Production variant with two R-4360-30 engines, 55 built. As C-119B with ventral fins added and tailplane extensions removed, 303 built. Project for a version with three-wheeled landing gear and removable pod, was designated XC-128A, none built. Project for a version of the 119D with two R-3350 engines, was designated XC-128B, none built. One C-119C modified with two R-3350-85 engines. Production variant, 256 built for the USAF and RCAF. As C-119F with different propellers, 480 built. C-119G modified as gunships, 26 conversions. Re-designed version with extended wing and modified tail surface, one converted from a C-119C. C-119F and G converted with a modified rear fuselage, 62 conversions. Used for aircraft equipped for medical evacuation role. One C-119G modified with two General Electric J85 turbojets in underwing pods. Five C-119Gs modified as YC-119K. C-119G modified to C-119K standard as gunships, 26 conversions. Modified variant of the C-119Gs, 22 conversions. A USMC R4Q-1 of VMR-252 in 1950. One C-119B converted with removable cargo pod. Initially used designation for YC-119D and YC-119E variant. United States Navy & United States Marine Corps version of the C-119C, 39 built. United States Navy and United States Marine Corps version of the C-119F, later re-designated C-119F, 58 built. Civil conversions of Fairchild C-119s with 3,400 lbf (15 kN) Westinghouse J34-WE-36 dorsal jet-pods. Increased take-off weight of 77,000 lb (35,000 kg). 29 jet-pak kits were supplied to the US civil market and 27 to the Indian Air Force. A single C-119 conversion, with quick-attach J34 jet-packs. A single conversion in 1967. Belgian Air Force received 40 new aircraft using Mutual Defense Air Program (MDAP) funds delivered from 1952, 18 x C-119F and 22 C-119Gs. Six surplus USAF C-119G were acquired in 1960. Brazilian Air Force received 11 former USAF C-119Gs using Military Aid Program funding in 1962. An additional USAF C-119G was acquired in 1962 as an attrition replacement. Royal Canadian Air Force received 35 new C-119Fs delivered from 1953, later upgraded to C-119G standard. Republic of China Air Force received 114 former USAF aircraft, they were in service from 1958–1997. Ethiopian Air Force received eight former USAF aircraft using Military Aid Program funding, after modification to C-119K standard with underwing auxiliary jets they were delivered in two batched, five in 1970 and three in 1971. Two former Belgian Air Force C-119Gs were acquired as spares source. French Air Force operated in Indochina nine aircraft loaned from USAF. Indian Air Force received 79 aircraft. Italian Air Force operated 40 C-119G new aircraft as Mutual Defence Assistance Program, five C-119G former USAF and transferred to United Nations in December 1960 and 25 C-119J surplus USAF / ANG aircraft. Royal Jordanian Air Force received four former USAF aircraft. Royal Moroccan Air Force received 12 former USAF aircraft and six former Canadian aircraft. Royal Norwegian Air Force received 8 surplus Belgian aircraft. Spanish Air Force received 10 former Belgian aircraft delivered but rejected all. Republic of Vietnam Air Force received 91 aircraft transferred from USAF. Five former USAF aircraft donated, operated by the Indian Air Force then passed to the Italian Air Force. 7 November 1952: Flight "Gamble Chalk One" (AF Ser. No. 51-2560), part of Exercise Warm Wind, flew off course and crashed in Mt. Silverthrone, Alaska, killing 19. 15 November 1952: Flight callsign "Warmwind Three" (AF Ser. No. 51-2570), part of Exercise Warm Wind, flew off course and was lost. 20 pronounced dead. 17 July 1953: Shortly after takeoff from NAS Whiting Field, Florida, a United States Marine Corps R4Q-2 transporting 40 NROTC midshipmen apparently lost power in the port engine, and crashed and burned after hitting a clump of trees. Six injured men were found in the wreckage, but only two midshipmen and one of the six crewmen survived. 10 August 1955: Two aircraft of a nine-plane USAF flight on a training mission collided over Edelweiler, Germany. One of the C-119s had developed engine trouble and lost altitude, causing it to strike another aircraft in the formation. A total of 66 people on board the two aircraft were killed. 27 March 1958: USAF C-119C, AF Ser. No. 49-0195, collided in midair with USAF Douglas C-124C Globemaster II, AF Ser. No. 52-0981 over farmland near Bridgeport, Texas, USA, killing all 15 on the Globemaster and all 3 on the Flying Boxcar. The two transports crossed paths over a VHF omnidirectional range (VOR) navigational radio beacon during cruise flight under instrument flight rules in low visibility. The C-124 was on a north-northeasterly heading flying at its properly assigned altitude of 7,000 feet (2,100 m); the C-119 was on a southeasterly heading, and the crew had been instructed to fly at 6,000 feet (1,800 m), but their aircraft was not flying at this altitude when the collision occurred. 12 December 1961: Two Belgian C-119 aircraft collided mid-air due to a lack of coordination at flight control, while attempting to land at Chièvres Air Base. All occupants of both aircraft were killed (13 in total). 5 June 1965: 51-2680, a C-119G operated by the US Air Force disappeared on a military transport flight between Homestead Air Force Base, Florida and Grand Turk Island Airport. Five crew and four air force mechanics were killed in the accident. 30 September 1966: A United States Air Force C-119 crashed into a mountain peak in the Angeles National Forest, killing all four men aboard. CP-10 – C-119G on static display at Melsbroek Air Base in Steenokkerzeel, Flemish Brabant. CP-46 – C-119G on static display at the Royal Museum of the Armed Forces and of Military History in Brussels. FAB 2304 – C-119G on static display at the 8th Parachute Field Artillery Group in Rio de Janeiro. FAB 2305 – C-119G on static display at the Museu Aeroespacial at Afonsos Air Force Base in Rio de Janeiro. IK450 – C-119G on static display at the Indian Air Force Museum, Palam in New Delhi. This unit is fitted with an external jet-pack. MM 52-6020 – C-119G on static display at Rivolto Air Base in Codroipo, Friuli-Venezia Giulia. MM 53-3200 – C-119G on static display at Pisa International Airport in Pisa, Tuscany. MM 53-8146 – EC-119G on static display at the Piana delle Orme Museum in Borgo Faiti, Lazio. ROKAF 3199 – C-119G on static display at the War Memorial of Korea in Seoul. ROCAF 3158 – C-119G on static display at the China University of Science and Technology in Tapei. ROCAF 3183 – C-119L on static display at Military aircraft park in Chang-hua County. ROCAF 3190 – C-119L on static display at Republic of China Air Force Museum in Gangshan, Kaohsiung. ROCAF 3192 – C-119L on static display at Rushan Visitor Center in Kinmen County. ROCAF 3202 – C-119L on static display at Yuanzhiluxiuxian Park in Nanhua District, Tainan. A former Canadian C-119G at the Air Mobility Command Museum. 48-0322 – C-119F on display at the Milestones of Flight Museum in Palmdale, California. 48-0352 – C-119B in storage at the Air Mobility Command Museum at Dover Air Force Base in Dover, Delaware. 49-0132 – C-119C on static display at the Pima Air & Space Museum in Tucson, Arizona. This aircraft also carries civilian registration N13743 and is currently in the markings of "Tanker 81" of Hemet Valley Flying Service of Hemet, California. This aircraft is currently on outdoor display and will be restored to original USAF markings. 49-0157 – C-119C on static display at the Pima Air & Space Museum in Tucson, Arizona. 49-0199 – C-119C on static display at the Castle Air Museum in Atwater, California. This airframe was transferred to the U.S. Forest Service after retirement from the Air Force. 50-0128 – C-119C on static display at Pope Field near Fayetteville, North Carolina. It is painted as 53-3182. 51-2566 – C-119C on static display at the Museum of Aviation at Robins Air Force Base in Warner Robins, Georgia. 51-2567 – C-119C on static display at the USAF Airman Heritage Museum at Lackland Air Force Base in San Antonio, Texas. 51-2675 – C-119F on static display at the U.S. Veterans Museum in Granbury, Texas. It was previously on display at the Pate Museum of Transportation in Cresson, Texas. 51-8024 – C-119G on static display at the Strategic Air Command & Aerospace Museum in Ashland, Nebraska. 51-8037 – C-119J on static display at the National Museum of the United States Air Force at Wright-Patterson Air Force Base in Dayton, Ohio. This aircraft was specially modified for the mid-air retrieval of space capsules reentering the atmosphere from orbit. On 19 August 1960 this aircraft made the world's first mid-air recovery of a capsule returning from space when it "snagged" the parachute lowering the Discoverer 14 satellite at 8,000 feet (2,400 m) altitude 360 miles (580 km) southwest of Honolulu, Hawaii. The aircraft was delivered to the Museum in November 1963. 52-5850 – C-119G on static display at the Grissom Air Museum at Grissom Air Reserve Base in Peru, Indiana. 53-3144 – C-119L on static display at Air Commando Park at Hurlburt Field in Mary Esther, Florida. 53-7836 – C-119L in storage with Everts Air Fuel in Fairbanks, Alaska. 53-8073 – C-119G in storage with Brooks Fuel in Fairbanks, Alaska. 53-8074 – C-119L stored at the Flying J Ranch near Pima, Arizona. 53-8076 – C-119L stored at the Museum of Flight and Aerial Firefighting in Greybull, Wyoming. 53-8084 – C-119L on static display in the Air Park at Little Rock Air Force Base in Jacksonville, Arkansas. 53-8087 – C-119L on static display at the 82nd Airborne Division War Memorial Museum at Fort Bragg in Fayetteville, North Carolina. 53-8150 – C-119L stored at the Museum of Flight and Aerial Firefighting in Greybull, Wyoming. 131673 – C-119F airworthy with John S. Reffett of Eagle River, Alaska. 131677 – C-119F on static display at the Mid-Atlantic Air Museum in Reading, Pennsylvania. This former Marine R4Q is reported to be the last C-119/R4Q operated by the U.S. military. 131679 – C-119F on static display at the Don F. Pratt Museum at Fort Campbell near Clarksville, Tennessee. 131688 – R4Q-2 on static display at the Pueblo Weisbrod Aircraft Museum in Pueblo, Colorado. 131695 – C-119F stored with John S. Reffett of Eagle River, Alaska. 131708 – R4Q-2 on static display at the Flying Leatherneck Aviation Museum at Marine Corps Air Station Miramar in San Diego, California. RCAF 22101 – C-119G on static display at Fort Campbell near Clarksville, Tennessee. RCAF 22103 – C-119G on display at the National Warplane Museum in Geneseo, New York. RCAF 22105 – C-119G on static display at Niagara Falls Air Reserve Station in Niagara Falls, New York. RCAF 22106 – C-119G stored at the Museum of Flight and Aerial Firefighting in Greybull, Wyoming. RCAF 22107 – C-119G on static display at the Hill Aerospace Museum at Hill Air Force Base in Roy, Utah. It is painted as the State of Utah and bears the incorrect USAF serial number 52-2107. RCAF 22108 – C-119F stored at the Museum of Flight and Aerial Firefighting in Greybull, Wyoming. RCAF 22111 – C-119G on display at the Hagerstown Aviation Museum in Hagerstown, Maryland. This airframe was used in the movie Always and was donated by Bob Stanford of Zenith Aviation. RCAF 22113 – C-119G stored at the Museum of Flight and Aerial Firefighting in Greybull, Wyoming. RCAF 22114 – C-119G on static display at the Aerospace Museum of California in McClellan, California. RCAF 22116 – C-119 on static display at Fort Benning in Columbus, Georgia. RCAF 22118 – C-119G on static display at the Air Mobility Command Museum at Dover Air Force Base in Dover, Delaware. After its RCAF service it was converted into an air tanker. Delivered to the museum in 1991, it was restored as a C-119G, fake Air Force Serial No. 51-2881. RCAF 22122 – C-119G on static display at the March Field Air Museum at March Air Reserve Base in Riverside, California. RCAF 22130 – C-119G on display at the Lauridsen Aviation Museum in Buckeye, Arizona. This airframe was used in the 2004 movie Flight of the Phoenix. RCAF 22134 – C-119G on static display at the Travis Air Force Base Heritage Center at Travis Air Force Base in Fairfield, California. RCAF 22135 – C-119G stored at the Museum of Flight and Aerial Firefighting in Greybull, Wyoming. C-119 Flying Boxcars from the 403rd Troop Carrier Wing. ^ The Chinese actually blew up three bridges in succession at the same point: the original concrete span, a wooden replacement, and a third M-2 steel treadway portable bridge installed by U.S. combat engineers. ^ Other sources state that the eight Flying Boxcars used on the bridge mission were U.S. Marine Corps R4Qs. ^ C-119F and R4Q-2 had R3350-85-30WA, R3350-89-36W, or R3350-89A-36W engines. ^ "Fairchild C-119 Flying Boxcar." globalsecurity.org. Retrieved: 19 May 2011. ^ Swanborough and Bowers 1963, pp. 262–263. ^ Mossman, Billy C., EBB AND FLOW: NOVEMBER 1950 – JULY 1951, p. 137. ^ Rumley, Chris (May 18, 2010). "314th delivers bridge to combat troops". littlerock.af.mil. Retrieved June 11, 2017. ^ Kelly, John W. "Mid-Air Retrieval of Heavy, Earth-Returning Space Systems" (PDF). NASA. Retrieved 26 September 2018. ^ "Discoverer 14 – NSSDC ID: 1960-010A." NASA. Retrieved: 28 June 2011. ^ Grandolini 1996, pp. 52–60. ^ "United States v. Fuchs" U.S. 9th Circuit Court of Appeals, Appeal 9810173, filed July 6, 2000. Retrieved: 28 June 2011. ^ "Aircraft accident Fairchild C-119C-22-FA Flying Boxcar 51-2560 Mt. McKinley, AK". Aviation Safety Network. Retrieved 25 October 2012. ^ Officer, Commanding. "Historical Report for period 1 July 1952 to 31 December 1952". Retrieved 25 October 2012. ^ "Aircraft accident Fairchild C-119C-23-FA Flying Boxcar 51-2570 between Anchorage, AK and Kodiak, AK". Aviation Safety Network. Retrieved 25 October 2012. ^ Gero, David B. "Military Aviation Disasters: Significant Losses Since 1908". Sparkford, Yoevil, Somerset, UK: Haynes Publishing, 2010, ISBN 978-1-84425-645-7, p. 78. ^ "1949 USAF Serial Numbers". Joebaugher.com. Retrieved 2010-06-25. ^ Ranter, Harro and Fabian I. Lujan. "ASN Aircraft accident Fairchild C-119F-FA Flying Boxcar 51-2680 Bahamas." Aviation Safety Network, 2010. Retrieved: June 28, 2011. ^ "Four Perish as C-119 Crashes in Mountains". California Digital Newspaper Collection. Retrieved 2018-06-19. ^ "Welkom bij Dakota". VZW DAKOTA, Documentatiecentrum van de 15 WING (in Dutch). Dakota VZW. Retrieved 24 January 2017. ^ Derenette, Lambert J.; Vermoote, Bjorn. "Fairchild C-119F Flying Boxcar". Belgian Military Aircraft Wreckhunters. Retrieved 11 June 2017. ^ Derenette, Lambert J.; Vermoote, Bjorn. "Fairchild C-119G Flying Boxcar". Belgian Military Aircraft Wreckhunters. Retrieved 11 June 2017. ^ "Airframe Dossier – Fairchild C-119G Flying Boxcar, s/n 2304 FABr, c/n 10968". Aerial Visuals. AerialVisuals.ca. Retrieved 24 January 2017. ^ "Fairchild C-119G – Flying Boxcar | Fairchild Eng and Airp Corporation". Museu Aerospacial. Retrieved 11 June 2017. ^ "Fairchild Packet C119 "Shatrujeet Bar" [IK444]". Warbirds of India. Warbirds of India. 29 June 2014. Retrieved 24 January 2017. ^ "Airframe Dossier – Fairchild C-119G Flying Boxcar, s/n IK450 IAF, c/n 11262". Aerial Visuals. AerialVisuals.ca. Retrieved 24 January 2017. ^ "Airframe Dossier – FairchildC-82 Packet / C-119 Flying Boxcar, s/n MM52-6020 AMI". Aerial Visuals. AerialVisuals.ca. Retrieved 24 January 2017. ^ "Airframe Dossier – Fairchild C-119G Flying Boxcar, s/n MM53-3200 AMI". Aerial Visuals. AerialVisuals.ca. Retrieved 24 January 2017. ^ "Firechild C-119". Museo Storico Piana Delle Orme (in Italian). Archived from the original on 2 July 2016. Retrieved 24 January 2017. ^ "Airframe Dossier – Fairchild EC-119G Flying Boxcar, s/n MM53-8146 AMI, c/n 249". Aerial Visuals. AerialVisuals.ca. Retrieved 24 January 2017. ^ "South Korea 60th Anniversry of the Korea War". Naver. 24 June 2010. Retrieved 11 June 2017. ^ "Airframe Dossier – Fairchild C-119G Flying Boxcar, s/n 3199 ROKAF, c/n 11212". Aerial Visuals. AerialVisuals.ca. Retrieved 24 January 2017. ^ Yang, S. H. (30 April 2016). "Fairchild C-119G Flying Boxcar – Taiwan – Air Force". Airliners. Leaf Group Ltd. Retrieved 25 January 2017. ^ a b c "Fairchild C-119 Census". Oldprops. Retrieved 25 January 2017. ^ Willemsen, Fred (17 August 2000). "Fairchild C-119G Flying Boxcar – Taiwan – Air Force". Airliners. Leaf Group Ltd. Retrieved 25 January 2017. ^ C119老母機簡介. China University of Science and Technology (in Chinese). Department of Aviation Mechanical Engineering. Retrieved 24 January 2017. ^ "C-119 Military Aircraft Park". Travel in Changhua County. Changhua Gov. Retrieved 24 January 2017. ^ Tseng, Q. (5 December 2009). "Fairchild C-119G Flying Boxcar – Taiwan – Air Force". Airliners. Leaf Group Ltd. Retrieved 25 January 2017. ^ C-119（空中車廂式）運輸機. R. O. C. Air Force Museum (in Chinese). R.O.C. Air Force Academy. Retrieved 24 January 2017. ^ "Location Dossier – Shatou Airport, Chin-men, Quemoy Island, Fujian – C-119C-119, F-104, F-5F-5". Aerial Visuals. AerialVisuals.ca. Retrieved 25 January 2017. ^ "Flying Boxcar/51-8016". Warbirds Resource Group. Retrieved 11 June 2017. ^ "Airframe Dossier – Fairchild C-119F Flying Boxcar, s/n 48-0322 USAF, c/n 10304, c/r N13745". Aerial Visuals. AerialVisuals.ca. Retrieved 23 January 2017. ^ Ball, Christopher. "History in Transit". Edwards Air Force Base. Retrieved 23 January 2017. ^ "Scrap Aircraft". GSA Auctions. U.S. General Services Administration. Retrieved 11 June 2017. ^ "Air Mobility Command Museum Rescues C-119". Warbirds News. Warbirds News. 2 January 2017. Retrieved 23 January 2017. ^ "Flying Boxcar ". Pima Air & Space Museum. Pimaair.org. Retrieved 23 January 2017. ^ "Flying Boxcar". Pima Air & Space Museum. Pimaair.org. Retrieved 11 June 2017. ^ "Aircraft on Display". Castle Air Museum. Retrieved 23 January 2017. ^ "Airframe Dossier – Fairchild C-119C Flying Boxcar, s/n 49-0199 USAF, c/n 10436, c/r N13744". Aerial Visuals. AerialVisuals.ca. Retrieved 23 January 2017. ^ Griffin, Rhonda (6 July 2009). "Pope's Air Park preserves history". Pope Field. Retrieved 24 January 2017. ^ "Aircraft on Loan (by Description)" (PDF). National Museum of the US Air Force. Retrieved 24 January 2017. ^ "Airframe Dossier – Fairchild C-82 Packet / C-119 Flying Boxcar, s/n 53-3182 USAAF". Aerial Visuals. AerialVisuals.ca. Retrieved 24 January 2017. ^ "C-119C "Flying Boxcar"". Museum of Aviation. Museum of Aviation. Retrieved 24 January 2017. ^ "Airframe Dossier – Fairchild C-119C-23-FA Flying Boxcar, s/n 51-2566 USAF, c/n 10524". Aerial Visuals. AerialVisuals.ca. Retrieved 24 January 2017. ^ "C-119 sn 51-2567". Airman Heritage Foundation. Airman Heritage Foundation. Retrieved 24 January 2017. ^ "Airframe Dossier – Fairchild C-119C Flying Boxcar, s/n 51-2567 USAF". Aerial Visuals. AerialVisuals.ca. Retrieved 24 January 2017. ^ "Airframe Dossier – Fairchild C-119F-FA Flying Boxcar, s/n 51-2675 USAF, c/n 10664". Aerial Visuals. AerialVisuals.ca. Retrieved 23 January 2017. ^ "Plane finds home at the Veterans Museum". Hood County News. Hood County News, Inc. 31 October 2012. Retrieved 23 January 2017. ^ "C-119G "Flying Boxcar"". Strategic Air Command & Aerospace Museum. Strategic Air Command & Aerospace Museum. Retrieved 23 January 2017. ^ "Fairchild C-119J Flying Boxcar". National Museum of the US Air Force. 14 March 2016. Retrieved 23 January 2017. ^ "Airframe Dossier – Fairchild C-119J Flying Boxcar, s/n 51-8037 USAF, c/n 10915". Aerial Visuals. AerialVisuals.ca. Retrieved 23 January 2017. ^ United States Air Force Museum Guidebook 1975, p. 53. ^ "C-119G Flying Boxcar". Grissom Air Museum. WordPress. Retrieved 11 June 2017. ^ "Hurlburt Field Memorial Air Park Guide" (PDF). Hurlburt Field. Retrieved 24 January 2017. ^ "Airframe Dossier – Fairchild C-119L Flying Boxcar, s/n 53-3144 USAF, c/n 11155, c/r N37484". Aerial Visuals. AerialVisuals.ca. Retrieved 24 January 2017. ^ "Airframe Dossier – Fairchild C-119L Flying Boxcar, s/n 53-7836 USAF, c/n 11253, c/r N8504Z". Aerial Visuals. AerialVisuals.ca. Retrieved 23 January 2017. ^ "FAA Registry [N8504Z]". Federal Aviation Administration. U.S. Department of Transportation. Retrieved 11 June 2017. ^ "Airframe Dossier – Fairchild C-119G Flying Boxcar, s/n 53-8073 USAF, c/r N9027K". Aerial Visuals. AerialVisuals.ca. Retrieved 23 January 2017. ^ "FAA Registry [N9027K]". Federal Aviation Administration. U.S. Department of Transportation. Retrieved 11 June 2017. ^ Leeuw, Ruud. "Mystery Fairchild C-119 at Flying J Ranch Airport, Arizona". RuudLeeuw.com. Retrieved 23 January 2017. ^ "Airframe Dossier – Fairchild C-119L Flying Boxcar, s/n 53-8074 USAF, c/n 177". Aerial Visuals. AerialVisuals.ca. Retrieved 24 January 2017. ^ "Airframe Dossier – FairchildC-82 Packet / C-119 Flying Boxcar, s/n 53-8076 USAF, c/n 179, c/r N8505A". Aerial Visuals. AerialVisuals.ca. Retrieved 23 January 2017. ^ "Airframe Dossier – FairchildC-82 Packet / C-119 Flying Boxcar, s/n 53-8084 USAF". Aerial Visuals. AerialVisuals.ca. Retrieved 24 January 2017. ^ "Airframe Dossier – Fairchild C-82 Packet / C-119 Flying Boxcar, s/n 53-8087 USAF". Aerial Visuals. AerialVisuals.ca. Retrieved 24 January 2017. ^ "Airframe Dossier – Fairchild C-119L Flying Boxcar, s/n 53-8150 USAF, c/n 253, c/r N37636". Aerial Visuals. AerialVisuals.ca. Retrieved 23 January 2017. ^ "Airframe Dossier – Fairchild C-119F Flying Boxcar, s/n 131673 USN, c/r N1394N". Aerial Visuals. AerialVisuals.ca. Retrieved 23 January 2017. ^ "FAA Registry [N1394N]". Federal Aviation Administration. U.S. Department of Transportation. Retrieved 23 January 2017. ^ a b Gleitsmann, Lars. "the two airplanes". FlyingBoxcar.com. Retrieved 23 January 2017. ^ Rambow, Bill. "Aircraft of the Mid-Atlantic Air Museum". Mid-Atlantic Air Museum. Retrieved 23 January 2017. ^ a b Leeuw, Ruud. "C-119s at Fort Campbell, KY". RuudLeeuw.com. Retrieved 23 January 2017. ^ "Airframe Dossier – FairchildC-82 Packet / C-119 Flying Boxcar, s/n 131679 USN, c/n 10846". Aerial Visuals. AerialVisuals.ca. Retrieved 24 January 2017. ^ "Actual Aircraft on Display in Pueblo". Pueblo Weisbrod Aircraft Museum. Archived from the original on 25 December 2016. Retrieved 11 June 2017. ^ "Airframe Dossier – Fairchild R4Q-2 Flying Boxcar, s/n 131688 USN, c/r N99574". Aerial Visuals. AerialVisuals.ca. Retrieved 25 January 2017. ^ "Airframe Dossier – Fairchild C-119F Flying Boxcar, s/n 131695 USN, c/r N8501W". Aerial Visuals. AerialVisuals.ca. Retrieved 23 January 2017. ^ "FAA Registry [N8501W]". Federal Aviation Administration. U.S. Department of Transportation. Retrieved 11 June 2017. ^ "Aircraft Listing" (PDF). Flying Leathernecks. Flying Leatherneck Historical Foundation. Retrieved 23 January 2017. ^ "Airframe Dossier – FairchildC-82 Packet / C-119 Flying Boxcar, s/n 22101 RCAF, c/n 10676, c/r N15505". Aerial Visuals. AerialVisuals.ca. Retrieved 24 January 2017. ^ "Airframe Dossier – Fairchild C-119G Flying Boxcar, s/n 22103 RCAF, c/n 10678, c/r N8092". Aerial Visuals. AerialVisuals.ca. Retrieved 23 January 2017. ^ "Airframe Dossier – FairchildC-82 Packet / C-119 Flying Boxcar, s/n 22105 RCAF, c/n 10736, c/r N15506". Aerial Visuals. AerialVisuals.ca. Retrieved 24 January 2017. ^ "Airframe Dossier – Fairchild C-119G Flying Boxcar, s/n 22106 RCAF, c/n 10737, c/r N3003". Aerial Visuals. AerialVisuals.ca. Retrieved 23 January 2017. ^ "C-119G "Flying Boxcar"". Hill Air Force Base. 23 July 2009. Retrieved 23 January 2017. ^ "Airframe Dossier – Fairchild C-119G Flying Boxcar, s/n 22107 RCAF, c/n 10738, c/r N966S". Aerial Visuals. AerialVisuals.ca. Retrieved 23 January 2017. ^ "Airframe Dossier – Fairchild C-119F Flying Boxcar, s/n 22108 RCAF, c/n 10773, c/r N5215R". Aerial Visuals. AerialVisuals.ca. Retrieved 23 January 2017. ^ "1953 Fairchild C-119G Flying Boxcar". Hagerstown Aviation Museum. Hagerstown Aviation Museum. Archived from the original on 15 November 2016. Retrieved 23 January 2017. ^ "Aircraft" (PDF). Hagerstown Aviation Museum. Archived from the original (PDF) on 3 March 2016. Retrieved 23 January 2017. ^ "Airframe Dossier – Fairchild C-119G Flying Boxcar, s/n 22111 RCAF, c/n 10776, c/r N8093". Aerial Visuals. AerialVisuals.ca. Retrieved 24 January 2017. ^ "Airframe Dossier – Fairchild C-119G Flying Boxcar, s/n 22113 RCAF, c/n 10824, c/r N3935". Aerial Visuals. AerialVisuals.ca. Retrieved 23 January 2017. ^ "Fairchild C-119G Flying Boxcar". Aerospace Museum of California. Aerospace Museum of California. Archived from the original on 6 January 2012. Retrieved 11 June 2017. ^ "Airframe Dossier – Fairchild C-119G Flying Boxcar, s/n 22114 RCAF, c/n 10825, c/r N15502". Aerial Visuals. AerialVisuals.ca. Retrieved 23 January 2017. ^ "Airframe Dossier – Fairchild C-82 Packet / C-119 Flying Boxcar, s/n 22116 RCAF, c/n 10860, c/r N5217R". Aerial Visuals. AerialVisuals.ca. Retrieved 25 January 2017. ^ "C-119G Flying Boxcar". Air Mobility Command Museum. AMC Museum Foundation, Inc. Retrieved 23 January 2017. ^ "Airframe Dossier – Fairchild C-119G Flying Boxcar, s/n 22118 RCAF, c/n 10870, c/r NR3559". Aerial Visuals. AerialVisuals.ca. Retrieved 23 January 2017. ^ "C-119G." amcmuseum.org. Retrieved: 8 July 2017. ^ "C-119G Flying Boxcar". March Field Air Museum. March Field Air Museum. Retrieved 23 January 2017. ^ "Fairchild C-119G Flying Boxcar". Lauridsen Aviation Museum. 9 September 2016. Retrieved 11 June 2017. ^ "Airframe Dossier – Fairchild C-119G Flying Boxcar, s/n 22130 RCAF, c/n 10955, c/r N15501". Aerial Visuals. AerialVisuals.ca. Retrieved 24 January 2017. ^ "FAA Registry [N15501]". Federal Aviation Administration. U.S. Department of Transportation. Retrieved 11 June 2017. ^ Veronico, Nick. "Outdoor Exhibits – C-119G "Flying Boxcar"". Travis Air Force Base Heritage Center. Travis Heritage Center. Retrieved 23 January 2017. ^ "Airframe Dossier – Fairchild C-119F Flying Boxcar, s/n 22134 RCAF, c/n 10993, c/r N15508". Aerial Visuals. AerialVisuals.ca. Retrieved 23 January 2017. ^ "Airframe Dossier – Fairchild C-119G Flying Boxcar, s/n 22135 RCAF, c/n 10994, c/r N8094". Aerial Visuals. AerialVisuals.ca. Retrieved 23 January 2017. ^ Bridgman 1951, p. 238c–239c. ^ a b Bridgman 1956, pp. 278–279. ^ C-119F/R4Q-2 Flight Handbook T.O. 1C-119F-1, 1 August 1956. Bridgman, Leonard. Jane's All The World's Aircraft 1951–52. London: Sampson Low, Marston & Company, Ltd., 1951. Bridgman, Leonard. Jane's All The World's Aircraft 1956–57. New York: The McGraw-Hill Book Company, Inc., 1956. Grandolini, Albert. "French 'Packets': Fairchild C-119 Boxcars in French Indochina". Air Enthusiast, Volume 66, November/December 1996, pp. 52–60. ISSN 0143-5450. Lloyd, Alwyn T. Fairchild C-82 Packet and C-119 Flyng Boxcars. Hinkley, UK: Midland Counties, 2005. ISBN 1-85780-201-2. Swanborough, F.G. and Peter M. Bowers. United States Military Aircraft since 1909. London: Putnam, 1963. United States Air Force Museum Guidebook. Wright-Patterson AFB, Ohio: Air Force Museum Foundation. 1975. 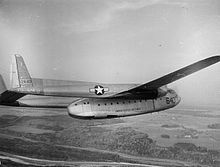 Wikimedia Commons has media related to C-119 Flying Boxcar. This page was last edited on 16 March 2019, at 21:04 (UTC).